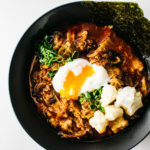 Making kimchi stew is one of my favorite things to do because it is incredibly easy, especially if you happen to have a bunch of leftover protein on hand. You can fancy it up if you like with a soft onsen egg and some crispy mochi bits but it tastes just as good with a bowl of plain white rice. 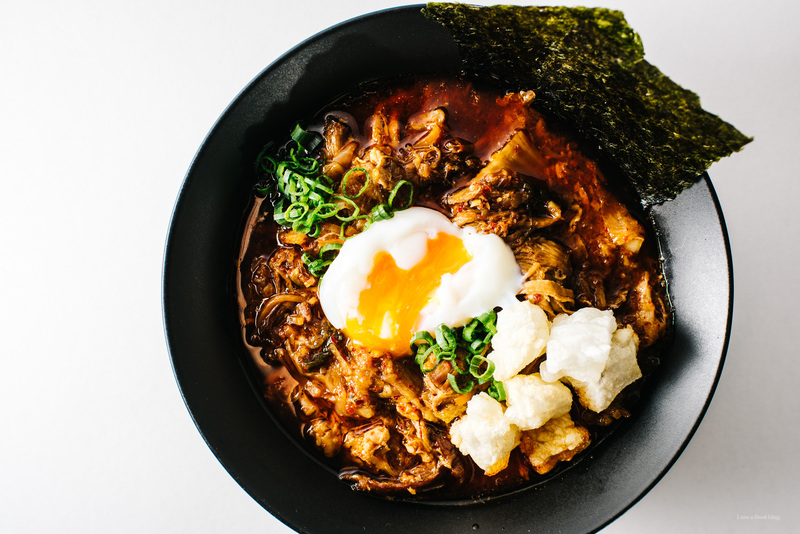 While Mike was editing these photos (I took them waaaaaaaaaay back), he asked me: Is this recipe just take kimchi stew out of the fridge and heat it up? I laughed and said, YES! 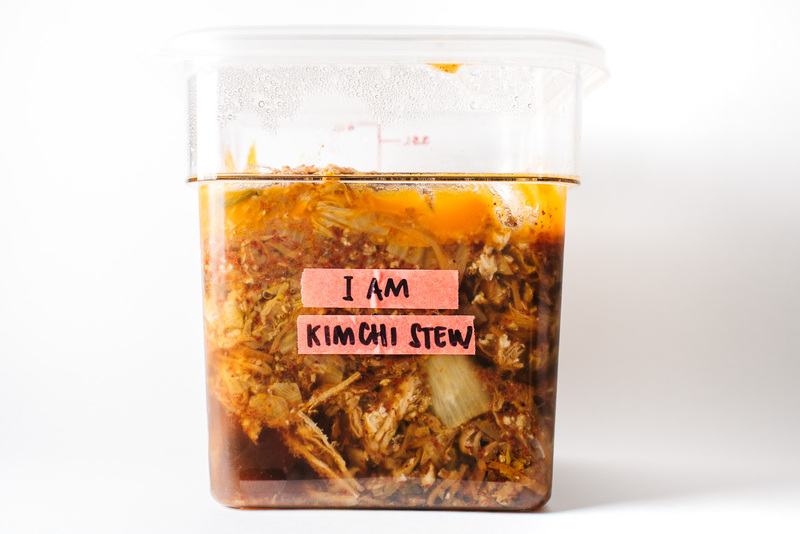 Okay, it’s not as easy as just taking a container out of the fridge, but making kimchi stew is one of my favorite things to do because it is, actually, incredibly easy, especially if you happen to have a bunch of leftover protein on hand. Essentially all it is, is: caramelized onions, a protein, kimchi, dashi, mirin, and some gochujang for spice. You can fancy it up if you like, as I did here with a soft onsen egg and some crispy mochi bits, but it tastes just as good with a bowl of plain white rice. The funny thing is that I didn’t used to like kimchi at all, but then I cooked through the Momofuku cookbook and discovered that I love kimchi, particularly when it’s been cooked to mellow out all of the flavors. Make a big batch, store it in the fridge, and nom on it when you’re hungry. I love having ready made things in the fridge – it’s the best kind of instant food out there! You can make this stew with any type of protein, but I’m partial to using pulled pork, especially if I have a bunch of it leftover in the fridge. Feel free to use leftover chicken as well, if that’s what you have on hand. This makes a lot of stew, which I love, but feel free scale it. In a large heavy bottomed pot or dutch oven, heat up the oil over medium heat. Add the onions and cook, until brown and caramelized, stirring often, about 10 minutes. Stir in the kimchi and pulled pork. Add the dashi, mirin and gochujang and bring to a gentle simmer. Turn the heat down to low and let simmer for 1 hour. Taste and season with salt and freshly ground pepper. 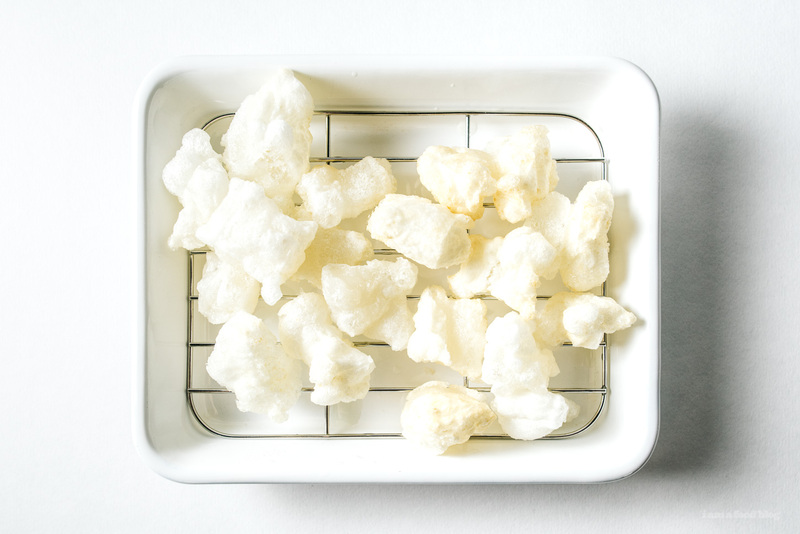 Make the crispy mochi: in a deep pot, heat up an inch of oil over medium heat. When it reaches 350°F, gently drop in the mochi pieces, being sure not to crowd the pan. Deep fry, moving every so often until lightly crispy and puffy. Remove and drain on paper towels or a wire rack. The mochi will puff up and deflate while cooking. 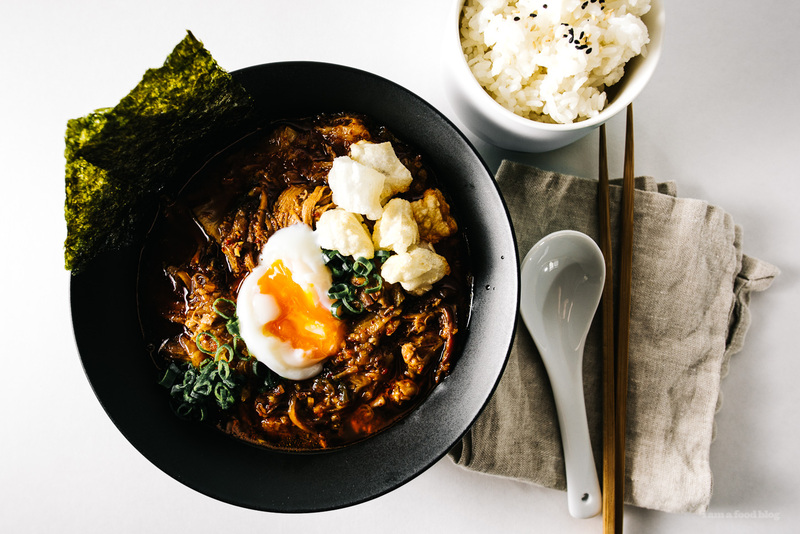 To serve, scoop kimchi stew into a bowl and top with the crispy mochi, a slow poached egg, sliced green onions, and seaweed. Serve with rice on the side and enjoy! mm this sounds so tasty 😍 i normally ignore the kimchi stews and such at korean restaurants because i’m distracted by everything else, but this sounds like perfect cozy food (: i think it works differently, since i typically have frozen mochi from mochitsuki on hand rather than storebought blocks of mochi, but i like to pan-fry mochi in a bit of oil, and then the insides get gooey and the outsides crisp up really nicely! mmm yes mochi cripsy outsides and gooey insides are THE BEST!! This is HEAVEN in a bowl!! You always make my food dreams come true, Steph.